Cybersecurity threats show no sign of abating. 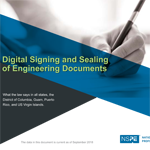 Protecting the critical infrastructure that keeps the country running goes beyond technical solutions, however. Many of the challenges relate to people and organizations. Read more. 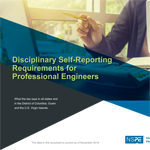 Ensuring the integrity of the professional engineer license is a top priority for NSPE and its state societies—all in the interest of protecting the health, welfare, and safety of the public. PE takes a look at some of the most recent advocacy actions of state societies in partnership with NSPE. The ability to lead has become something of a prerequisite for becoming an engineer. Creating a sense of belonging or community and helping those under you to grow and develop are two of the hallmarks of modern leadership. You Be the Judge: The Man Who Knew Too Much? Policy Perspectives: Is Your License Safe?